Despite all the drama of this shot it is not terribly complicated in its setup. It is only a two light shot, some simple drapes and a smoke machine. Almost genuinely a case of photography being "smoke and mirrors". The drapes are tied to the walls of the studio area. Some are directly to the side of Carla; others go right to the back wall. This spread creates a sense of depth to the whole image. A smoke machine is placed behind the model on the floor. It is actually blowing through a bit of old tubing and some crumpled paper to ensure it goes upwards behind Carla in a random, diffused spread. Lighting is one red-gelled light directly behind the model and a main light front and left with a large softbox. With smoke machines you have limited shooting time before the smoke overwhelms the space and you have to seriously ventilate to clear the space, so work out your shoot strategy and sequence in advance. When the first smoke is released into the image you get a completely different kind of picture than when it is filling the whole space. 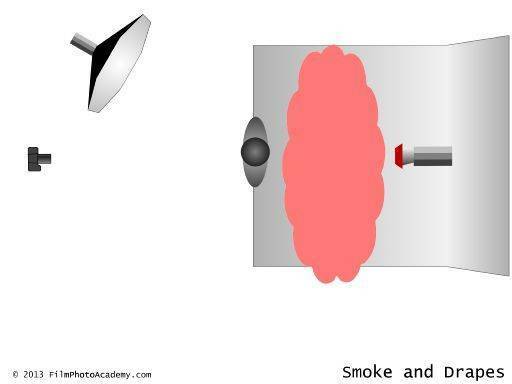 In particular as it comes in front of the model you have a short while to capture the models shadow in the smoke before it becomes just too foggy. I wanted a sort of "Goddess Rising From the Volcano" look to the image, so Carla is standing on a raised dais and I'm shooting low to the floor. Although the principal setup of this shot was for the big wide shot I also knew there would be possibilities for some closer shots too. All the time I am being very careful that my subject is between the rear light and the camera to prevent it burning out the image. Surprisingly perhaps this setup also works really well in monochrome. This maybe not the most obvious choice having setup all that colour, but doesn't it look great and ethereal?